(Verso, print): signed in pencil, at upper left edge, by Winogrand: "Garry Winogrand [sideways]". (Verso, print) inscribed in pencil, at center: "GARRY WINOGRAND"; in pencil, at lower left corner: "L58.26 (Win)"; in blue ballpoint ink, at lower right corner: "x". 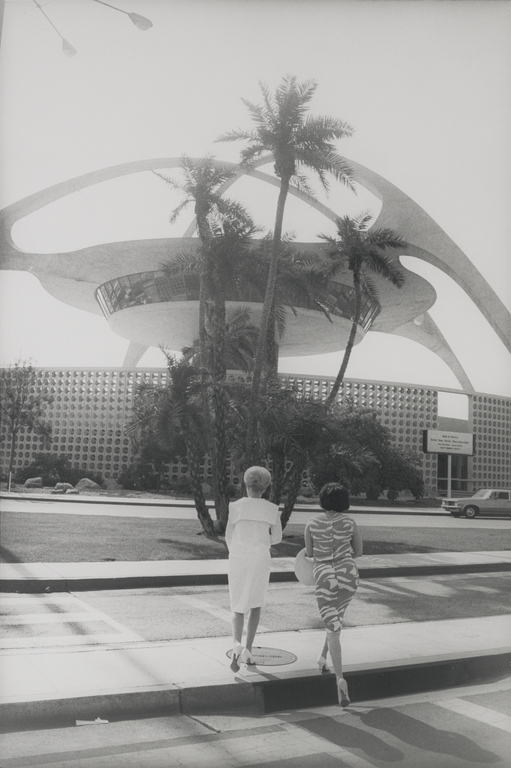 Los Angeles International Airport's space-age tower looms over two women stepping onto a curb as they head toward it. For years, Winogrand visited L.A., where he eventually settled. He was drawn to public places where he could find large numbers of people and photograph their interactions. This image combines two of Garry Winogrand's favorite subjects, airports and women-and alludes to a third-animals. Winogrand often made comparisons in his photographs between animals and people, as he does here. The woman on the right in an animal-print dress seems appropriately headed toward a cluster of palm trees. This image is not as complex as many of Winogrand's pictures, which are so filled with visual elements that they often border on chaos. Still, the elements here are layered-the women in the foreground, the trees in the center, and the tower in the background-adding up to a well-balanced photograph.